Leaves are an important natural resource! This is the time of the year to reap the harvest. Here are a few ways to utilize this great natural resource in your yard. Yards or pastures of leaves are a wonderful crop to use as mulch. The nutrients in leaves will help to create better soil and nutrients for your grass. You spent all year watering, fertilizing, pruning, and caring for this bonus harvest, so don’t waste them. Some home owners vacuum up every leaf, bag them, and send them to the landfill. Some yards may have more leaves than others, but proper mulch management can free space in the landfill and save you money and time. Many lawn farmers have inconsistent lawns. During construction, builders often scrape the top soil off the lot, so they can sell it later. The subsoil also has heaves of rocks that have little soil in them. These areas in your lawn are never quite the way you want them. You water the heck out of them which works in the short term but does not encourage root growth. Soil is needed. You can add soil or make your own. Here are some dirty thoughts about mulch! Mulch bin Having a mulch bin is a wonderful way to recycle kitchen and lawn wastes. Keep adding layers of debris until you need to add the rich soil to your yard or garden. Do not add pet waste. Instead, dig a ‘poo hole’ in a yard corner that will deal with that. Don’t let the leaves lay Leaves also contain acids which will kill grass. If a thick matt of leaves covers and area, they will rot everything hey touch. Mow them or rake them away so that they are spread out and not a carpet. 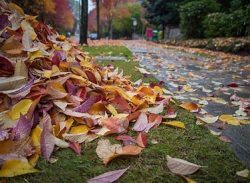 Dry leaves work best Spread your raked leaves evenly across the yard, so they can dry and become brittle. This takes a few days. Once dry, use a mulching mower to make the leaves into small bits that can easily enhance your soil. Vegetable garden boost Montana soil is sticky and tight. Roots grow better in soil that is loose and softer. Dig a trench across your garden and dump dry leaves into it. Cover with soil and forget about it for the winter. Once you are ready to garden, till and mix the soil in your garden a month before planting. Your soil will be composted and ready to invite roots. A quick mulch bin Connect 4 pallets into a standing box. Staple some chicken wire to the inner sides. This will hold the mulch in place while keeping critters out. 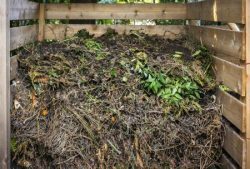 Air and moisture can also help to rot the mulch. A simple lid is also a good idea. Occasionally, pitch fork the mulch to mix it up and speed the rotting process. Local farmers welcome leaves If you insist on wasting your leaf nutrient harvest, share them with farmers. They welcome the free mulch and your leaves will not be wasted in a landfill. Mulching grass also helps when you mow Throwing away lawn clippings is also a waste. Use a mulching blade year around to chop up nitrogen filled grass clippings. You need to mow more frequently but never have to bag and rake. Consider dealing with this annual harvest in a different and more productive way! Leaves also encourage fishing worm populations. Just saying! For more Montana Grant, rake him up at www.montanagrantfishing.com.